I had been watching this item and laughing. 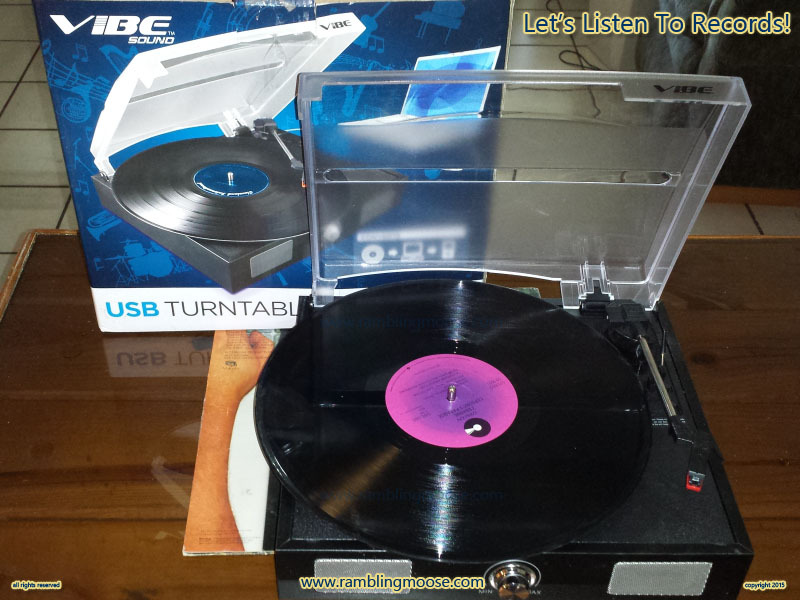 Vibe Sound USB Turntable With Built-In Speakers! Ok, I have a stash of old school Vinyl Records in the house. I'll admit it, I actually bought some of these when they were Current. I won't pretend to be a Hipster. I do have a goatee right now, but that's because I was bored. Maybe it saves time, yeah that's the excuse, it saves time! I've got a reputation around here for a number of things. I've become "That Guy". It's a reputation of That Guy Who Can Actually Fix Things. As a result I am given things that people can't figure out or just don't want to mess with. You know the type. You've got some old gadget that has been taking up space in storage. It annoys you or your partner and you decide to toss it out. Put a tag on it on the night before Trash Day saying "Free To A Good Home" and hope someone who needs it finds it. Or you do what this guy did. A neighbor who I know in passing lived around the corner. I'd pass by from time to time and wave hello, or perhaps we'd bend each other's ears on a dog walk. Lets call him A Dog Walk Friend instead of an Acquaintance because Dog Walk Friends are Friends Who You Get To Know Better Later. We're walking past the other night and he's getting stuff out for trash day when I hear "I'm Beat!". He's standing by a 1970s vintage Console Radio complete with 8 Track and a box under his arm. The Free To A Good Home tags are flapping in the breezes. "Here! Take This. You fix things, see what you can do with it!". A box that had seen at least one move and some strapping tape was thrust at me. I pass the dog leash off to Kevin who is shaking his head "NO!" just out of direct view. I tell him to stop shaking his head and take the box for examination. The pack rat is about to get a new toy. While laughing, I tell my friend that I had been watching this and I still have a foot locker full of records. Mine and some from Dad. Dad's old Swing Era records, still in the Time/Life boxes, ready to be listened to and loved. I should do something with those records. I've had them in the foot of my closet since before I moved to Florida because I couldn't bare to pass them on. They're complete but not particularly worth much on the "resale market". Collectable to me, but ... well I can't get rid of them, Dad would hate it. Even if he is gone to the great beyond. It isn't the kind of thing I'd buy for myself. USB Turntables aren't exactly all that expensive, but I have a better turntable from back in the day when a good turntable was a requirement instead of like now when it is a confusing relic from the last century. We got the box home, and I took it out to the backyard where I inspected it. For good measure, I slid the equipment out, sprayed the box with bug killer, then slid the turntable back into the box. That should kill anything that might be lurking. Waiting until the next morning, I unboxed it. It was complete. I dug out my last milk crate of old records, finding someone else's taste in music I realized "Not Mine" and moved them aside. I found my crate. I guess I'm down to just one crate of my own records. Choosing a classic disco record, I put it on the turntable. Powered it up. There in Mid-Fi I got to listen to a song that I had heard dozens of times before. It even has the software if I am bold enough to try it. Apparently I can plug it into my laptop and capture the vinyl onto an MP3 so I can listen to the same stuff that I have been listening to since my childhood another time. Mmmm pops and crackles on MP3 complete with loss and low top end. Ok, it's a nice toy and it didn't cost me anything. So since you're reading over my shoulder, how about flipping the LP over. They only put one track on the A Side, and I want to hear Cerrone's Paradise again.